Early Birth Starts on April 20, 2019! Our Winter Promotions have begun! Please feel free to reach out to us with any questions or inquire at the front desk! Eastern School has opened a new lesson room fully equipped with a brand new timpani set, marimba, and other percussion instruments! The room is also available to rent for anyone looking for a place to practice or learn! We’re very excited to announce our 2019 Winter Concert! It will be held on Saturday, January 26th, 2019.
and showcase their efforts in a large-scale performance in front of friends and families. This festival will be a great experience for students preparing for NYSSMA or for those looking to broaden their stage exposure. Application fees vary depending on instrument, solo, ensembles. Please contact our school for more information & inquiries. 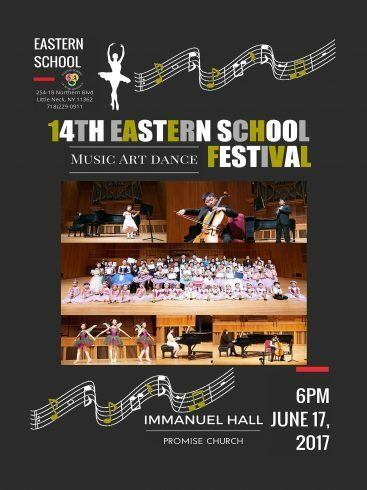 We’re very excited to announce our 14th annual Eastern Music Festival! It will be held on Saturday: June 17th, 2017.
and to showcase their efforts in a large-scale performance in front of friends and families.